This portrait of the legendary golf course designer was created in conjunction with the redesign of the Oakland Hills golf course in Bloomfield Hills, Michigan. 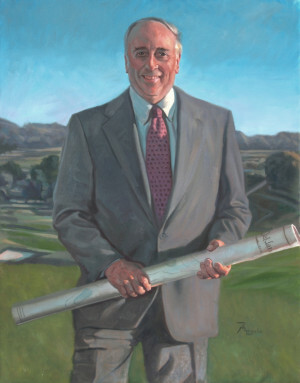 In keeping with the family traditions, my father painted the portrait of Rees’s father, Robert Trent Jones, several years ago. Father and son now hang side-by-side at the Oakland Hills Country Club.